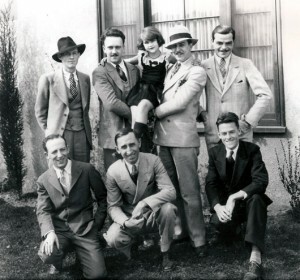 Top row: Walker Harman, Ub Iwerks, Lois Hardwick, Walt Disney, Rudolph Ising; bottom row: Friz Freleng, Roy O. Disney, Hugh Harman. Friz Freleng (August 21, c. 1905 – May 26, 1995) was a cartoonist, animator, and producer who is best known for his work on Looney Tunes and Merrie Melodies cartoons from Warner Bros. He was also the co-founder of DePatie-Freleng Enterprises that produced a number of cartoons, including The Pink Panther Show. Freleng was born in Kansas City, Missouri, in the early 20th century. The reported year of his birth varies from 1904 to 1906. He began his animation career here, working for United Film Ad Service, where he worked with Ub Iwerks and Hugh Harmon. When Walt Disney moved to California from Kansas City in 1923, he sent back the message that his fellow animators should join him. Freleng didn’t immediately make the move, waiting until 1927. At the Disney Studio, Freleng worked on Oswald the Lucky Rabbit and the Alice Comedies. Freleng later moved to New York for a period, where he worked on the Krazy Kat cartoons. Freleng joined the Warner Bros animation division along with Hugh Harmon and Rudolph Ising when the company secured the rights to their Bosko character. During this period, Freleng became Warner’s top director, introducing Porky Pig in 1935. In his later years he also developed the characters of Yosemite Sam, Sylvester, Tweety, and Speedy Gonzales. The Warner studio closed in 1963. Freleng and David DePatie formed DePatie-Freleng Enterprises. The produced cartoons for Warner Bros, created the Pink Panther cartoon for the movies and television, and produced a number of other television series. In 1980, DePatie-Freleng was sold to Marvel Comics, and was renamed Marvel Productions. 1977 – Daytime Emmy Awards; Won Outstanding Children’s Informational Specialfor ABC Afterschool Specials: My Mon’s Having a Baby. 1980 – Emmy Awards; Nominated for Outstanding Animated Program (Pink Panther in the Olym-pinks”; nominated for Outstanding Animated Program (Pontoffel Pock, Where are you? ); nominated for Outstanding Individual Achievement – Animation Program.